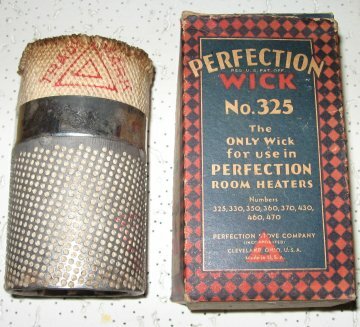 No factory-made wicks for the Perfection 300 and 400 series heaters have been available for many years, but wicks can be made to fit those heaters! 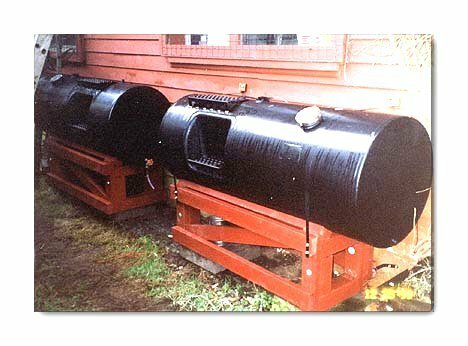 It is easy to keep old but good Perfection 300 and 400 series heaters working. 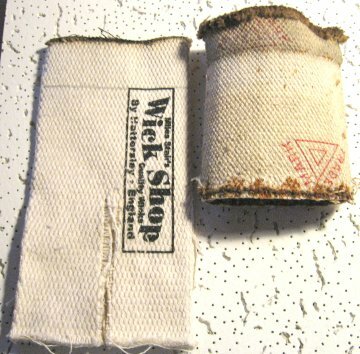 At left, an original Perfection 325 wick. The carrier is 2 3/4" in diameter. At right, a Perfection 325 wick compared with a Perfection 500 wick. Note that the 325 wick does not have "tails" below the wick carrier. 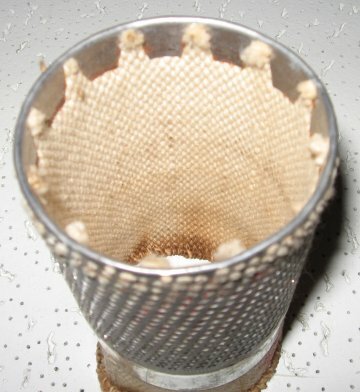 At left, a view of the bottom of an original Perfection 325 wick. The metal tabs are gently pried up with a flat bladed screwdriver and the old wick pulled out from the top, as shown at right. 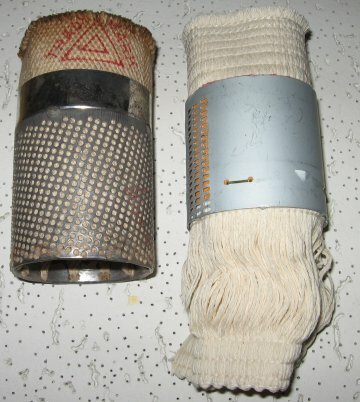 The left photo shows my special Perfection diameter wick on the left, compared to the original Perfection 325 wick removed from the carrier, as shown above. The new wick is then cut with 5" of the top remaining. A heavy pair of shears will cut the wick. 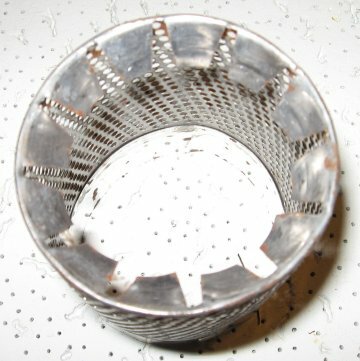 The new trimmed wick is then inserted (cut side down) into the old steel carrier. Make sure the wick fits under the tabs, as shown at right. 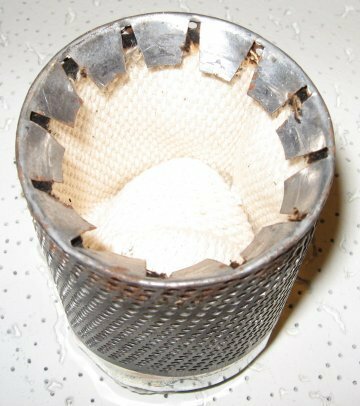 The tabs can then be crimped back on the wick with a pair of pliers, but they can also crimp the folded edge of the tab too tightly. It is better to push the top of the tab down with a flat bladed screwdriver until it is tight against the wick. That will ensure the tabs can be bent out again to accept another new wick. The new wick can then be installed following the directions shown below from a 325 wick box. 1. Remove the old wick as follows: Lit out the flame spreader "A" with a turn to the right, and with the bandwheel "D", turn the wick as high as it will go; now remove the wick by lifting it out. 2. Insert the new wick into the wick tubes, press it down until the metal carrier of the wick engages with the teeth on the lower end of the handwheel spindle. 3. Turn the wick down as far as it will go. If any loose threads are unraveling from the top of the wick, clip them off with scissors. 4. Replace the flame spreader. Make sure that the reservoir is well filled with oil. Allow the new wick to soak in the oil for a few minutes before lighting.